Congregation Emeth’s Sisterhood has been meeting regularly since 2001, before the congregation had a permanent home. Sisterhood offers an opportunity for the women of Congregation Emeth to socialize and participate in such activities as assisting with special Yom Tov Onegs (holiday receptions) and maintaining the Mazel Tov book of resources for families with an upcoming bar or bat mitzvah. Members of Sisterhood also help out with Emeth’s annual fundraising events and create and deliver Yom Tov (holiday) baskets before Rosh Hashanah to congregants unable to attend services. 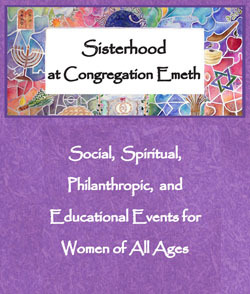 Congregation Emeth’s Sisterhood Cookbook is available through the gift shop. Sisterhood is open to all women who want to be involved in a variety of activities with other women in the community. Dues for Congregation Emeth members are $36; for nonmembers, $54. The money helps fund each year’s programs.